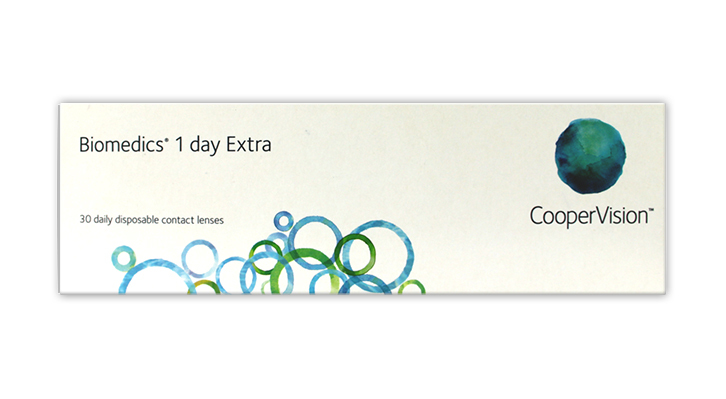 Biomedics 1 Day Extra contact lenses provide a natural, comfortable, lens wearing experience. Designed to maximise the feeling of all day comfort. An excellent upgrade for existing one day lens wearers or for those monthly lens wearers wanting to upgrade to the added convenience that 1 day lenses provide. Each box contains 30 daily disposable soft contacts in buffered saline solution. 45% polymer (Ocufilcon D) 55% Water and visibility tint with UV inhibitor . Please note these are the same lenses a Coopervisions Biomedics 1 Day, just a new box and `Extra` added to the wording. New: We have introduced a new daily lens for dry eyes and even more comfort - Crystal Aqua Daily, at a promotional limited offer price of only £5.99 / 30 lenses. A great replacement for Biomedics 1 Day extra - at 1/2 the price! I bought these because they were cheap, and I suppose they're alright for their price. They dry out very quickly and I had a lot of issues with them falling out or drifting. I've never had to carry around a spare set of lenses before, but I definitely had to with these! I bought these as the usual clear crystal ones were out of stock and I needed some lenses. In comparison, these feel much thicker and aren't as comfy all day long.. Crystal ones are tons better and more comfortable. Got these substituted for the Crystal dailies and have to say I find these very comfortable. Been using them for a week, and had no trouble with wearing them all day. I think they're a tiny bit more comfortable than the Crystals, so would have been a 5-star review were it not for the fact they're twice the price. If you get them offered as a same-price replacement I would certainly consider them. I’ve been wearing these daily disposable lenses for years and haven’t had any problems. My optician first prescribed me these when I could no longer wear monthly disposables and my eyes were ok with a change in lens straight away. I’ve been reading the negative reviews and am wondering whether or not if these customer’s opticians recommended biomedics as an alternative to their usual lenses. I don’t buy my lenses from my optician as they are more expensive than on-line suppliers, but I wouldn’t change my lenses without first consulting my optician. I had these substituted for crystal dailies and have realised I can't go back so am now buying them for the full price. I can wear them all day with no problem, my eyes don't dry out and I have no problems getting them in. I normally use Crystals, but because they were out of stock I had to try something else. I went for these Biomedics ones and I was not impressed at all. It quite expensive but still did not sort our my dry eyes issue. Once I was done with Biomedics I had to look for any others because Crystals were still out of stock( they are so cheap!). And then I found Proclear made by Cooper Vision. The price is the same as Biomedics but trust me the lenses are A M A Z I N G. P.S. I have been wearing lenses for 12 years.